It’s been over 25 years since I’ve done any serious sailboat racing. As a teenage kid growing up on a sailboat in Santa Barbara, CA my three brothers and I regularly raced in everything from short course one-design dinghys, to ocean races in keelboats. As the saying goes, “that was then, this is now.” How much of that experience would I remember, and what skills would be missing after so many years away from sailing? I remembered that sailboat racing can be both exhilarating and frustrating at times. I very much wanted to enjoy racing sailboats again, but our busy schedule at home and at work left no time to even practice sailing. Bonnie (my wife of 20 years) signed on to be the crew, a novice sailor who had no sailboat racing experience of any kind. What could I possibly have been thinking choosing the C15 North American Championships as our “maiden voyage” in the boat, and our first attempt at racing? Fortunately we set our expectations properly, and agreed to just try to have fun and not capsize the boat! Little did we know how much more we would gain from the experience. First though, perhaps a little bit of “history” is in order. We purchased our 1987 built C15 #3546 from an individual in Los Angeles three years ago with the thought of using it as an affordable family day-sailor. I had seen C15’s at regattas in Southern California many years before and appreciated the boat’s simplified rigging, and one-design performance. The C15 National Association website provided me with valuable information to get started. I then joined the C15 Message Group online, and began to read about rigging and tuning tips, as well as fleet activities nearby. Our boat needed some work to be seaworthy (let alone race-worthy), but as anyone with family of three young children under age 6 knows, there is often too much going on and not enough time and energy to get it done. So our dream of sailing as a family was postponed month after month. Nevertheless, with much interest I read the fleet racing reports, in particular the 2006 NAC’s in Yaquina Bay, Oregon, and the 2007 NAC’s in Alamitos Bay, California. Wow, that sounded like fun! I was inspired by C15 Association Vice Commodore Charlie Quest’s compelling and sincere invitation to attend the 2008 NAC’s hosted by Half Moon Bay Yacht Club which is only a three hour drive from our home and thought, “maybe we CAN do this!” I must say that even with months of planning and time to prepare ourselves and the boat, most of the work to get ready for the event came down to the last 3 weeks before race weekend. In the end I felt confident that I had “all the pieces of the puzzle” but we still had not rigged, launched, or sailed the boat until the day we arrived at HMBYC for the races! Oddly enough, my biggest concern was meeting the class bylaws requirements for “measurement certification”. Although there are many aspects to this, I soon learned that one of the big advantages of having a “one-design” boat that has not been modified is that it will (almost always) conform to the certification. In our case the boat was 5 lbs. too light, a problem that was easily corrected by adding weight to the hull. Our sails have the necessary “royalty patch” sewn on, and checked out within the sail dimensions allowed. We were cleared for racing! The Syd Corp qualifying series of five races were held on Friday, August 15 in light winds (0 ““ 10 knots) in the flat waters of the Pillar Point Harbor. These conditions ended up being perfect for us in the sense that it allowed us to become familiar with the boat and learn from our mistakes without doing too much physical (or physiological!) damage in the process. Out of the 16 boats that signed up, we ended up in ninth place overall, which put us in the Cabrillo Fleet (also known as the “B” Fleet) for the weekend’s championship races as specified in the NAC Regatta Policy of the Class Bylaws. The intent of this provision I believe is to give developing sailors the opportunity to competitively sail against others with similar skills and abilities. 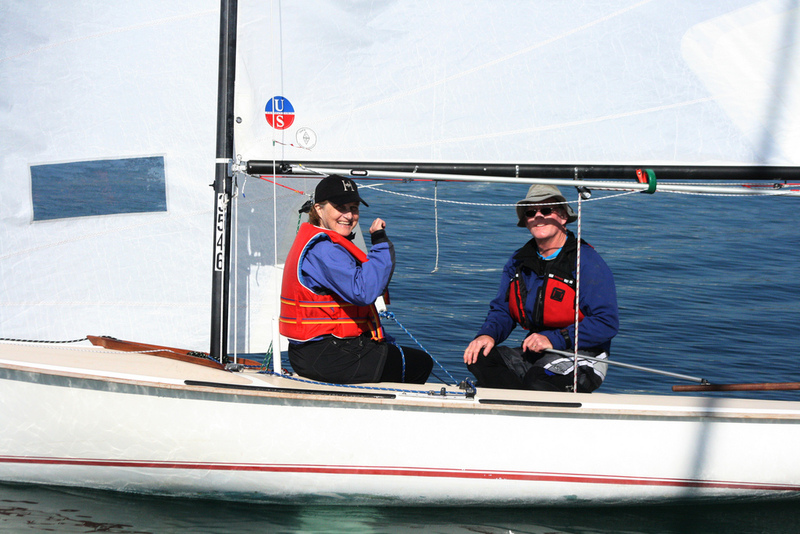 Former Cabrillo Fleet Champion skippers include Kiersten Vance in 2006, and Charlie Quest in 2007, both who have since gone on to race competitively at the Corinthian Championship “A” Fleet level. Bonnie enjoyed crewing the boat during these qualifying races, and was impressed at the level of competitive sailing by the fleet. Our sailing teamwork improved with each race, and we even managed some good boat speed at times. We also became familiar with what would be a key tactic to success in the racing that followed: get a good start, and sail in clear air in order to sail fast! On Saturday, August 16 the C15 Cabrillo Fleet North American Championships got underway with 7 boats competing for fleet honors. Once again, the winds started out in the 5 ““ 10 knots range from the southerly direction, and it stayed that way all day. “This never happens”, one of the local HMB sailors told me! These wind conditions presented some special challenges for both of the fleets. Large rafts and long strands of kelp began to appear in the harbor, blown in from the coastline, through the breakwater entrance right onto the race course. You can’t sail fast dragging a bunch of kelp, so additional course changes were often needed to keep clear. The wind direction also limited the race committee to “windward-leeward” courses that traversed the relatively narrow width of the harbor. This area of the harbor also happens to be where many pleasure boats are anchored or moored, and a live bait barge and shipwrecked boat are located. Sailing your way through these obstacles certainly added an unexpected challenge to the racing! After a particularly bad start in the first race, we managed to get lifted to the layline at the weather mark, and rounded it in second place. A last minute puff of wind at the leeward mark gave us an inside overlap, and we were able to sprint to the nearby finish for a first place. That first race gave us the “formula” for the rest of the day’s racing. Our tactics of getting to the starting line on time, with boat speed, and sailing in clear air gave us five more first place finishes. Our racing however included some mishaps. Besides having some bad tacks, in the second to last race we bent our whisker pole in half around the shroud during the first leeward mark rounding, and Bonnie had to hold it together by hand on the next down-wind leg. We repaired it with our boat paddle and zip-ties for the final race. It was a rather odd looking “whisker/paddle”, but it worked! Sunday, August 17 dawned with identical weather conditions, and limited race course selections. One of the other advantages to being in the developmental “B” fleet is that you get to watch the “A” fleet start their races, and sail out on the course ahead of you. Our “B” fleet was keen to spot any advantage displayed in the “A” fleet, and learn from or use it as best they could. In the second race of the day, a few of us noticed Kiersten Vance jump out to a four boat-length lead at the start of that race by perfectly executing a bold port-tack start on the rest of the “A” fleet. Five minutes later there were three of us in the “B” fleet trying to repeat the same port-tack start! By day’s end we were able to win three more hard fought races to finish the series with “all bullets.” Better yet, we had lots of fun, and we did not capsize! Thank you to the Half Moon Bay Yacht Club for hosting the 2008 C15 NAC event. Their race committee, club officers, and numerous member volunteers did a wonderful job in making the weekend something special for all of the racers. 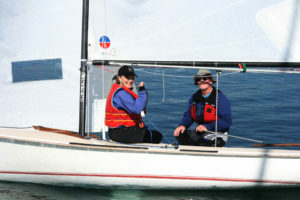 Bonnie and I look forward to sailing in more local racing events as time and schedules permit. We have a year to get ready for the 2009 NAC’s, planned to be held at Huntington Lake. As C15 Cabrillo Fleet Champions this year we are automatically promoted to “A” Fleet at the next NAC’s, so we have lots to look forward to!